Russell Gardner sold his Chevrolet business to General Motors after his sons entered the Navy during World War I. After the war, the three decided to build their own automobiles. The Gardner Motor Company was established in St. Louis Missouri with Russell E. Gardner, Sr. as chairman of the board, Russell E. Gardner, Jr. as president, and Fred Gardner as vice-president. Their previous experience had been in the assembling of cars, so it was not surprising that the Gardner was assembled from bought-in parts. Lycoming engines were used throughout the years of production. A four-cylinder model with a 112-inch (2,800 mm) wheelbase and medium price was introduced in late 1919 as a 1920 model. Sales in 1921 were 3,800 cars, which increased to 9,000 in 1922. 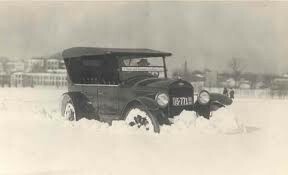 In early 1924 Cannon Ball Baker established a new mid-winter transcontinental record from New York to Los Angeles in 4 days, 17 hours, and 8 minutes in a Gardner. They started to prepare to expand the product line and distributorship network. The plant's capacity was 40,000 cars annually, and by 1925 these included both sixes and eights. The fours were dropped in 1925, with both sixes and eights being produced in 1926 and 1927. For 1928 and 1929 the eights were the only engines used. During the summer of 1929, Gardner announced two "very important" automobile contracts. Sears, Roebuck and Company wanted Gardner to develop a new car to be sold by mail order. The other venture was with New Era Motors, to manufacture the front-wheel-drive Ruxton. With the stock market crash in late 1929, both deals were off. For the 1930 model Gardners, they returned to the six-cylinder engine only. In January 1930 the company announced a front-wheel-drive six-cylinder car, An 80 hp (60 kW) six on a 133 in (3,380 mm) wheelbase with a Baker-Raulang body which sported a longer hood and with distinctive low-slung lines. Rare in America, they used Lockheed hydraulic internal-expanding brakes and two-way hydraulic shock absorbers. Unfortunately, it turned out that they would only produce prototypes of this model. The 1931 models were the same as the 1930 model, just mildly updated. In mid-1931, Russell E. Gardner, Jr. solicited the permission of his stockholders to stop producing automobiles. The reasons he gave for his company's failure were that Gardner had been unprofitable after 1927 due to fierce competition from the major producers of automobiles and their control of many sources of parts supply. The Gardner funeral car was built through 1932, but then the company ended all production.